Microsoft’s keynote speech at CES 2012 may have been the company’s last at the annual trade show, but CEO Steve Ballmer didn’t make too much of the parting of ways. Microsoft has more often than not announced key products at their own shows in the fall rather than at CES. Still, Ballmer’s keynote showed off a lot of the heavy-hitting items that Microsoft will depend on in the coming year, and that you’ll look to buy. On the top of that list is the company’s next major update to Windows. Here's quick a rundown of the tech Microsoft thinks is most important for consumers in 2012. Prior to the keynote, Nokia and Microsoft announced the Nokia Lumia 900, which may prove to be Microsoft’s fighting chance at really coming to prominence in the smartphone market in 2012. The Nokia Lumia 800 was available only in Europe before CES and enjoyed good reviews, and the 900 seems to improve upon an already solid phone with 4G capabilities and a front-facing camera. "I think with the Windows phone we’re clearly on the right track." Ballmer also lauded the more curated aspects of the Windows Phone 7 marketplace, which sharply contrasts with the wide-open market on Android devices. And unlike iOS, which has lots of single-use apps that live largely independently of each other, Windows Phone 7's “tiles” integrate text, search, and social networks to make messaging, maps, and organization easier. 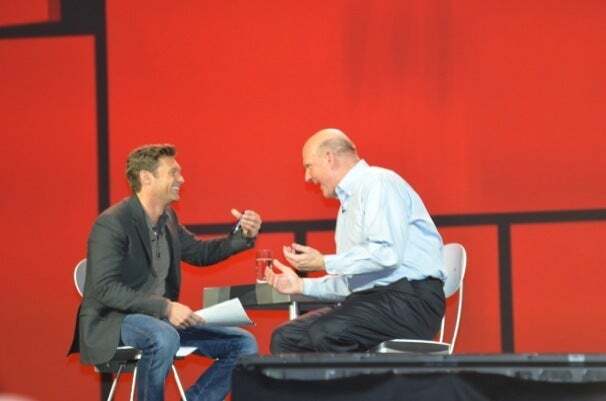 “I think with the Windows phone we’re clearly on the right track,” said Ballmer. The Nokia Lumia held the spotlight, but Ballmer also announced that this Wednesday T-Mobile will offer the Nokia 710 in the US, as well as the HTC Titan 2, which launched today on AT&T’s 4G network with a 16-megapixel camera built in. Although Microsoft took the wraps off the revamped OS last fall, Microsoft revisited its upcoming overhaul to Windows during the keynote. 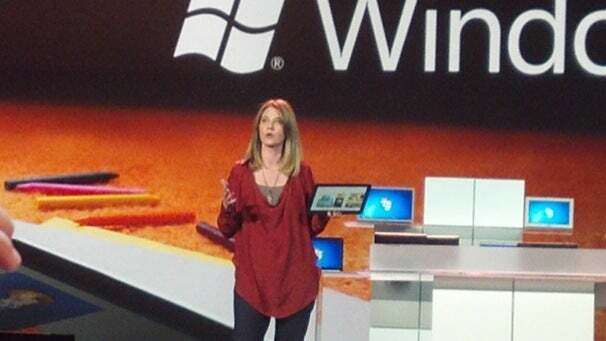 Chief Marketing Office Tami Reller did a short demo of Windows 8 on a Samsung tablet, and noted that the Microsoft Windows store will open in late February so people can buy apps for Windows on both tablets or more traditional PCs. Also, in a move that reflects a changing attitude towards building individual apps or websites with Flash, Reller noted that the Metro-style browser in Windows 8 would take full advantage of HTML5. Similarly, the tiles that define Windows 8 are different from traditional apps because they’re “alive"--in other words, the information within the tile updates without you having to open that app. The audience cheered when Reller demoed Windows' “picture password”. Ballmer also noted that every Windows 7 PC will be ready to download Windows 8 on day one. Touting Xbox and Xbox Live as “the future of home entertainment”, Craig Davison, product leader for XBox, demoed voice activation within the entertainment system and showed off Bing integration so users can search for movies by title or actor. Davison also announced that the Lumia 900 phone will be able to work as a sort of controller for Xbox, continuing a industry-wide trend that focuses on interoperability between mobile tech and living room tech. Microsoft also highlighted a partnership with Verizon FiOS to bring 26 live TV channels integrated into Xbox, and a partnership with NewsCorp to bring a Fox programming to the system. Last but not least, Ballmer reiterated that the Kinect would be available for Windows on February 1, a much-anticipated promise for the likes of programmers and game-enthusiasts.